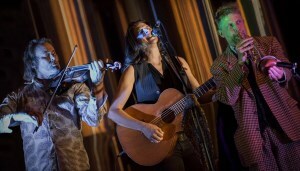 Pandora’s Karavan presents music with depth & presence, keeping it real with a repertoire of beautiful songs on meaningful themes – songs from various genres – from jazz standards to popular music, country, cabaret and the songs of the great songwriters such as Leonard Cohen and Tom Waits. Pandora plays solo or with various players in different line-ups. The current working trio comprises Pandora on guitar and vocals, Chris Gillespie on violin and Peter Barraclough on trumpet & flugle horn.